If after traveling hundreds or thousands of miles, you want to relax and enjoy your vacation feeling and being as comfortable as you do in your own home – this is the vacation rental for you and your family. We take pride in that everyone who visits enjoys that the home provides them nearly everything you’d have in your own home to make your stay comfortable and enjoyable. The full modern kitchen is equipped for anyone wanting to provide home cooked meals, mixing cocktails, baking, or nuking popcorn during their stay. There is an abundance of pots, pans, dinnerware, flatware, glasses, cups and utensils for every purpose. There’s a small sitting room off the Master bedroom at the front of the house which provides a serene and picturesque view of the harbor. It’s great for morning coffee, tea or just relaxing with a good book while the sunrise welcomes the day. Our two decks are great for outdoor dining, tanning or simply relaxing. One deck is above the garage and provides a great view overlooking the property and an ocean view. The rear deck is off the dining room with a grass covered back yard and gas grille in proximity. Just down our street is the famous Samoset Resort and only ¾ mi.away is the Rockland breakwater and lighthouse. The ferry landing, just over a mile, provides transportation to a group of nearby islands at reasonable rates. Our home is conveniently located and close to attractions, restaurants, shopping, hospital, and across the street from the Rockland Harbor. Most important is that the center of the town is within walking distance (1.3mi) from our location. The annual Rockland Lobster Festival and the North Atlantic Blues Festival are two of the region’s most popular events during the peak season. At the center of town are boutique shops, galleries, cozy coffee shops and restaurants known to please diverse palates. All of this is complimented by the sereneness of main street and the friendliest merchants and townspeople who work and live in the community. There is so much to enjoy in Rockland as well as the surrounding cities and towns nearby. You and your family will find your stay here as one of your most special vacations. We live in Rhode Island and have been here all our lives. Rockland Maine has been a favorite place for us for quite some time. We both grew up in Rhode Island but my wife's aunt lived in Rockland. My wife visited her aunt, uncle and cousins in Rockland annualy-usually lobster festival week - and fell in love with this small seaside town. When we met in the 80's, I joined her on her visits to Rockland. We found this home on our way to visit the Samoset Resort and the Rockland breakwater and purchased it in 1998. There is a great view of the harbor from our home. There is a small sitting room off the master bedroom with a large picture window where you can relax with a coffee, a good book or your ipod and truely relax. You can also go to the large deck above the garage and capture the ocean breeze and sunshine along with a view of the harbor. A small town with plenty of restaurants, galleries and stores. The famous Farnsworth Museum is in the heart of town and is a must see! Rockland harbor is across the street from our home. Wake up to a great view each morning from the master bedroom and attached sitting room. Catch the sunrise on the upper deck - calming, wonderful. Top load various cycle washer. 12 towels provided for use during your stay. Above stove, easy to operate. Large dining room table and chairs. One leaf extension. A small selection of interesting movies for a variety of tastes. Lawn and trim work is done bi-weekly. Deck off dining room through sliding glass doors. A staircase leads to an upper deck over the garage which provides a nice view of the harbor. Chairs & tables provided. As advertised. Clean,comfy. Nice proximity to lighthouse harbor break and Rockland. 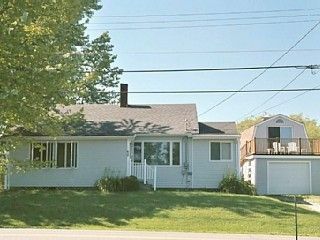 This cute 3-bedroom, 1 bath home comes with some extras worth noting: a small enclosed sun room off the master bedroom is ideal for morning coffee or just staring at the Penobscot Bay across the way. We also took advantage of the large dining room table, which easily seats six, and we had several friends over for dinner. The kitchen comes fully equipped and we found everything we needed. We hoped to return next year with friends, but sharing a bathroom with four mature adults just didn’t seem feasible. And, two double beds and a twin might also be a problem. While the house does have a washer and drier in the basement, the outside entrance was too steep for us, especially while carrying a load of clothes. The windows and fans offered nice breezes during unseasonably warm weather for the first week in September. The back deck and the elevated deck were also nice additions, but fog and heat kept us inside when we were “home.” Really though, we weren’t “home” all that much. I mean, after all, we were in Maine! The home was perfect for our needs. I stayed with a few colleagues for a workshop. The home is very cozy, extremely clean (thank you Dennis! ), and exactly as advertised. Dennis and Carrol we're great and responsive when my colleague arrived before me and had trouble getting in. I'll rent this place again next time I come. Morgan thank you for your review. We want to make every stay at our home enjoyable and comfortable. We are pleased to know everything worked out for you and your colleagues. We look forward to your return. Everything we needed was available in the kitchen and the owner was extremely helpful and communicated well. the home is just down the road from the Rockland Breakwater lighthouse and an easy drive into the Farnsworth Museum. We really enjoyed the location overall but it is separated from the bay by a road and a neighbors large yard. The views are very pretty but as stated in the property description , it is not directly on the water. Having a washer and dryer available in the basement was great. This property was a great location for day tripping along the coast. It was comfortable for the 4 of us, (2 couples), and we enjoyed sitting on the deck for coffee, and cooking lobsters on the grill out back. Plenty of cooking utensils, and comfortable beds. Thank you!!! Many Maine vacations we have spent here. Just a quick note to say, again, that we highly recommend this for a vacation stay. We have used this comfy, bright, clean, and well-located home for years----2-week stays twice a year. Our last review, in 2011, is still applicable, as are all the other reviews, before and after, so I will let them speak for themselves. If you want to relax and just hang out and enjoy the ocean breeze, beautiful sunsets, dining by the ocean, a backyard barbecue or lobster & clam boil this is the place to do it. Or you can ferry to the islands, play golf, tennis, sail, hike, bike, fish, swim, or go to the cinema. Whatever your desire - this is the place for you and your family.